Enable Paypal payment gateway only for guests. Enable Paypal payment gateway only for members. Enable Paypal payment gateway only for specific user roles. Enable Paypal payment gateway only for members from United Kingdom who purchases only simple products. Enable Paypal payment gateway only for guests from United Status or France who purchases custom product type created by another plugin. With PRO version, you can select multiple scenarios from the above list for same payment gateway. For example, to use Paypal, subscribers may need order value higher than 100 and authors may need order value lower than 100. With Free version, you can only have one set of conditions for single payment method. Examples uses Paypal as payment method. This can be replaced with any payment method available in your site. Example uses WooCommerce simple product type. This can be any WooCommerce product type available by default or any product type created by custom plugins. Example uses subscriber and author user roles. This can be any user role. 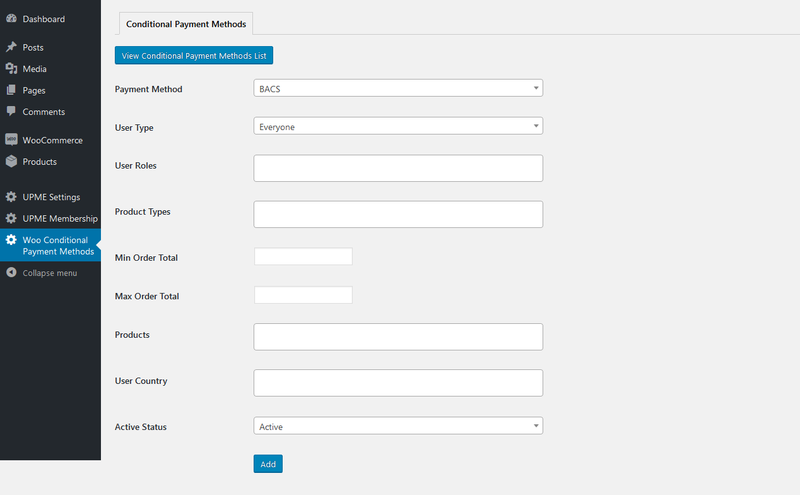 Once Conditional Payment Methods PRO for WooCommerce is activated, you will see a settings menu on the left menu called Woo Conditional Payment Methods. Click on the menu item to get the screen for adding payment method conditions, as shown in the following screenshot. Let’s look at the available fields. 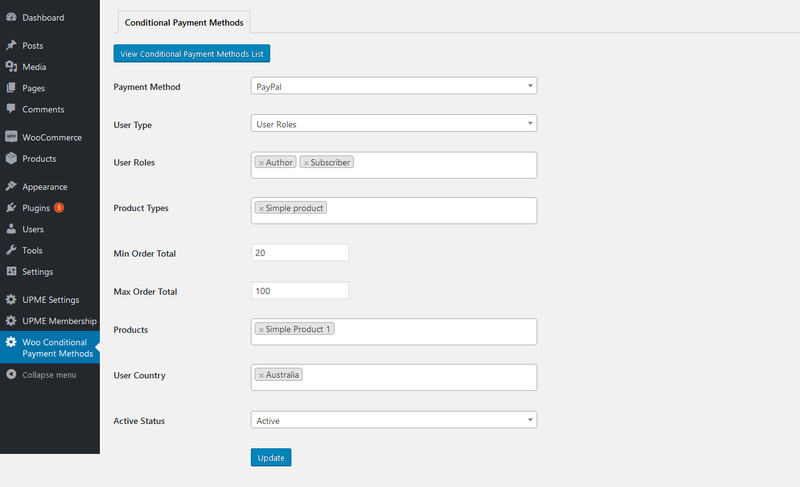 Payment Method – Payment methods enabled in WooCommerce checkout settings section will be listed here. You can select a payment method to add the conditions for enabling it on checkout. User Type – provides 4 options called Everyone, Guest, Members and User Roles. When Everyone is selected, payment method will be always visible depending on other conditions. When Guest is selected, payment method will be only available for guests. When Member is selected, payment method will be only available for logged in users. When User Roles is selected, payment method will be only available for user roles specified in the next setting. User Roles – If User Roles is selected for User Type field, you can add the allowed user roles from the available user roles list. This includes custom user roles created by other plugins. Product Types – WooCommerce allows you to create different types of products such as Simple products, Variable Products etc. This field allows you to define the product types for allowing the payment method. Assume you select Simple products for this setting. In such case, payment method will be only enabled when all the items on the users cart has the simple product type. If one of the product has a different type, condition is not matched and payment method is not displayed. Min Order Total – This field defines the minimum order total value required to display the payment method. If users cart value is less than this value, payment method will not be available. Max Order Total – This field defines the maximum order total value to display the payment method. If users cart value is greater than this value, payment method will not be available. Products – This field define the products for this condition. If you add products to this field, user will only see the payment method when users cart only contains products defined for this field. If cart contains other products, payment gateway will not be visible based on current condition. User Country – This field defines the shipping countries of users allowed to see the payment method. This is useful for blocking certain payment method for certain countries. Active Status – This field defines whether payment method condition is active or inactive. If you don’t need conditions for a payment method, you can make it inactive to disable it and use it in future when required. Once you click the Add button, conditions will be saved and payment conditions list will be shown similar to following screenshot. You can click on Add Conditional Payment Method button to add conditions to another payment method or click the Edit link to edit the conditions for created payment methods. Following screenshot previews the edit payment method conditions screen. You can add different conditions for each of the available payment method on your site. Following screenshot previews the list with multiple conditions for the same payment method. This version supports multiple set of conditions for each payment method. This is not a supported feature in free version. Following screenshot previews the checkout screen of WooCommerce. This screen contains 3 payment methods. These methods will be displayed / hidden based on the conditions added in the previous section. Upload and extract the woocommerce-conditional-payment-methods-pro zip file into /wp-contents/plugins folder in your WordPress installation. Now you are ready to get started with the settings. You can hire the developer of Conditional Payment Methods for WooCommerce to customize existing features or add new features according to your requirements. Please contact the developer at innovativephp@gmail.com for any customization requests for Conditional Payment Methods for WooCommerce. Display payment methods on checkout by combination of product types, user types, products, order value and user country.